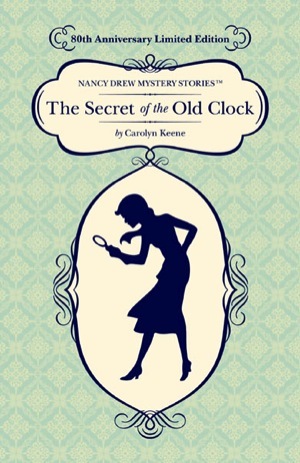 On April 28, 2010 the Nancy Drew series turned 80 years old and, to celebrate, publisher Grosset & Dunlap is releasing an 80th anniversary edition of the first book, The Secret of the Old Clock. In the series eighteen-year-old Nancy lives with her father, Carson Drew, and solves crimes in the fictional town of River Heights. She is usually accompanied by friends Bess and George, as well as boyfriend Ned Nickerson. According to USA Today, girls are still reading Nancy Drew and it’s nice to see that she’s still popular after 80 years. The books are attributed to Carolyn Keene, but that’s a pseudonym used by ghostwriters. When I was younger, I remember having a hard time wrapping my brain around the idea that Carolyn Keene wasn’t a real person. Nancy Drew Sleuth has an excellent run down of the history of Nancy Drew and more information on the ghostwriters who worked on the series. I absolutely loved Nancy Drew when I was a kid, and I read both the original books with the yellow covers and the paperback Case Files that were so popular in the late 80s and early 90s. Looking around the Internet, I was really surprised to find a lot of disdain for the Case Files (which I absolutely LOVED). They featured an updated Nancy with more stylish hair and clothes, and also had more emphasis on romance. Don’t get me wrong; I also loved the originals with their hidden passageways in every house and secret compartments in every desk. In both versions, Nancy is smart, observant, and gutsy. She’s the leader among her friends and when they get nervous, she stays cool, calm, and confident. In other words, she’s a really great role model for young girls everywhere. I still have a box of the Case Files in my basement and while going through them, I found my favorite one: Case #24, Till Death Do Us Part. It’s the one where Ned proposes to Nancy and she turns him down, only he then gets engaged to the new girl in town the next day. Nancy is suspicious and tries to get to know this girl by going skydiving with her and is nearly killed when her parachute won’t open. Besides Till Death Do Us Part, my other favorites are the Hardy Boys/Nancy Drew crossovers. They always started with Nancy, Bess, and George on a case when they just happen to bump into Joe and Frank Hardy who are coincidentally on a similar case and then hijinks ensue. My favorite is Double Crossing where Nancy and her friends are on a cruise ship and Joe and Frank are working undercover as staff members on the ship. So tell me, did you read Nancy Drew when you were younger? Which book was your favorite?